Well done to the Eastwood & Partners Sheffield Half Marathon Team who did a fantastic job at successfully completing the Sheffield Half Marathon on Sunday 14th April 2019. It was a cold start on Sunday, with a notoriously tough steep climb to Ringinglow village. It was certainly no easy task, even for the experienced runner! We are therefore really proud of the commitment and dedication of ALL our team members who trained to compete in the race, and we would like to thank everyone who generously donated money in aid of Mind (for better mental health) charity. Mind is a national charity which aims to provide advice and support to empower anyone experiencing a mental health problem. 1. Going to Sheffield for interview with Dr. Eastwood in 1987. 2. Having a horse nibble me repetitively whilst digging trial pits in 1995. 3. My time on site at Royal Marsden Hospital as R.E. - an amazing learning experience Sep 1989 – July 1990. 4. Watching Big Barry the junior draftee start floating down the Thames in a leaking rowing boat during the Barking Jetty survey. 5. Meeting Ozwald Boateng in the Cutting Room of his Savile Row shop in 2017. 6. Doing an "After Hours" survey in the Octagon, Colchester to diamond drill through downstand beams and getting pizza at midnight. 7. Summer outing to Brighton with fish and chips after swimming in the sea with colleagues (early 1990’s). 8. Attending the launch of Envirocheck Russia Maps at the Ice Bar and drinking vodka from ice glasses. 9. Digging trial pits on my birthday at an old toy factory in Rochester and excavating bucket loads of plastic doll's limbs. 10. Wet, Cold, Windy, Sundays in Colchester car park 1991 – 2018. 11. Opening up countless historical buildings and seeing how the structures all piece together. 12. Passing my P.E.2 (I.C.E.) and being a (very proud) Chartered Engineer in 1992. 13. Taking Dr. Eastwood on the London Underground to attend the opening of Churchill Gardens Square in 1993 and going the wrong way (twice). 14. Working in wonderful places like Christies, The London Diamond Centre and the BT tower. 15. Experiencing the views over Olympic Park and using a mobile platform above the height of velodrome roof 2017. 16. Being responsible for accurately measuring Crystal Palace football pitch at Selsdon Park. 17. Being told to dig trial pits more quietly by Anne Robinson as she was filming on the other side of the boundary wall at Bibury Stud in 1998. 18. Designing the support structure for an incredibly large fish tank in the Dark Trace head office in the Strand 2016. 19. Being asked to try on RHS princess Diana's hat "for size" the day before she laid the foundation stone to the new building at Royal Marsden Hospital on 6th June 1990. 20. Watching the entire site "wobble" as the excavator dumped spoil on a housing site underlain by alluvial soils in Lewes (before the vibro and drainage was undertaken) in 1989. 21. Designing fixings for listed Art Deco aluminium birds mounted on the front facade at Sussex Gardens 2014. 22. Survey of a racing stud (with horses) in Newmarket. 23. Inspecting a church steeple on the Isle of Wight for WE and having to travel by ferry which I found very exciting as part of a “normal” working day. 24. Supervising the "opening up" of a beautiful hardwood floor in the building where the film Kingsman had been filmed in 2014. 26. Measuring up inside the Clock Chamber of the town clock in Thamesmead between the hourly chimes. 27. Inspecting inside the sheds at a mushroom growing business in the dark! (mid 90’s). 28. Writing the very first electronic time sheet for Eastwood & Partners. 29. Writing a specification for saving all the timber "drillings" during alteration work at a National Trust property in Morden. 30. After months of negotiation...finally getting approval from the council for a venting trench to be constructed around the perimeter of Mariners Walk housing development at Eastbourne. This was to dissipate any methane present and involved excavating a vertical trench in the natural gravel and infilling with free draining gravel! 31. Designing the replacement extremely heavy cast iron balconies and their difficult fixings in Connaught Street - 2017. We recently had the pleasure of hearing from the newly retired Mark Jones, who informed us that the money donated by E&P as a retirement gift was included in a cheque presented by his performance group, the Barlow Red Barrows, to the Nenna Kind charity. The Red Barrows have a full season ahead and are set to perform at Hope Show and Ashover Show. Keep up the fantastic work, Gents! 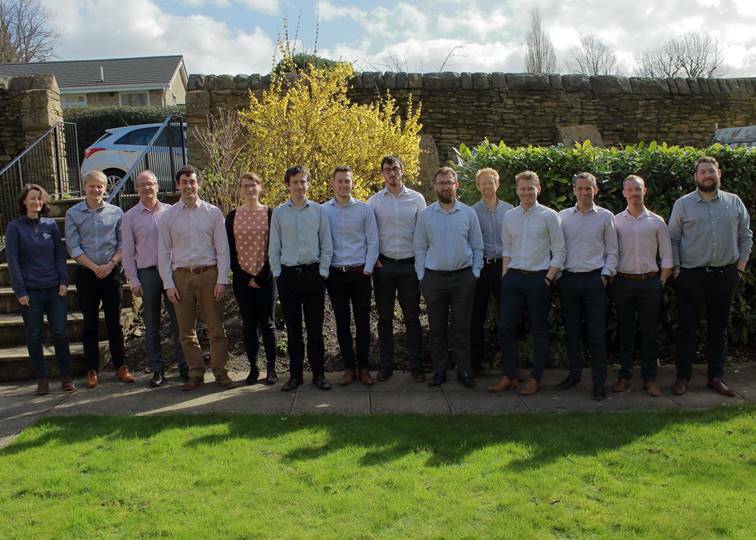 Eastwood & Partners have a strong team of 15 employees participating in Sheffield Half Marathon in April this year. The team have been training hard over the past four months to maximise performance (and competition), and all in aid of raising money for Mind (for better mental health) charity. Mind is a national charity which aims to provide advice and support to empower anyone experiencing a mental health problem. They also regularly campaign to improve services, raise awareness and promote understanding of mental health awareness. If you would like to show your support and donate to raise money for this fantastic charity, please do so via our Just Giving Page https://www.justgiving.com/fundraising/eastwoodandpartners. As a proud sponsor of the Charity Ball, Eastwood & Partners was thrilled to see so much money raised for such a wonderful cause as Weston Park hospital. A grand total of £30,500 was raised towards the Sheffield hospital which is a centre of excellence in the fight against cancer.